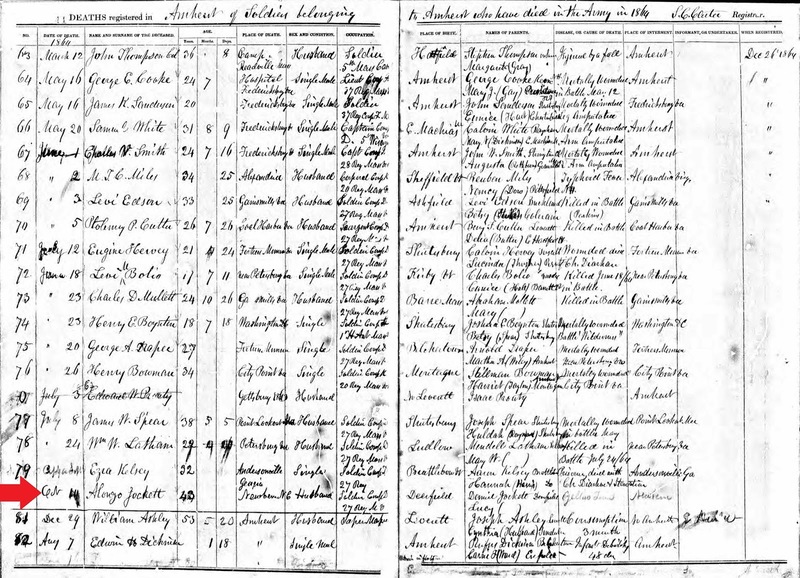 What were the circumstances that led George Henry, my 4th great-grandfather, to change his surname from Jucket to Hawks? Over the course of several posts, I've mapped out the chronology of known facts, which support the claim that he was the son of Daniel and Lucy (Hawks) Jucket and raised to adulthood by Lucy's sister. 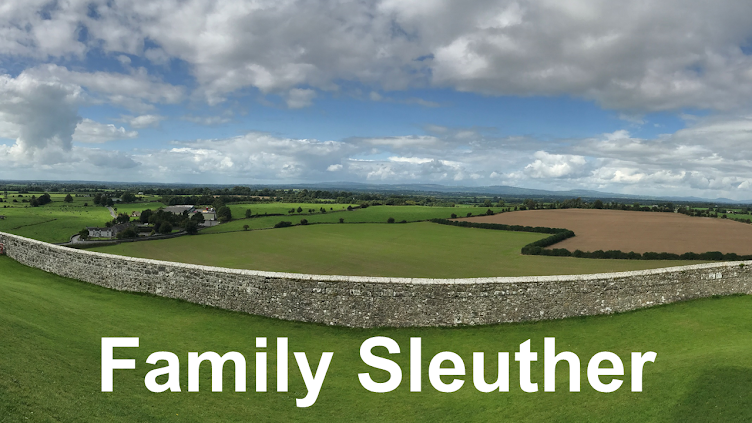 In the early phases of my research, a genealogist with the New England Historic Genealogical Society advised that I look for siblings. 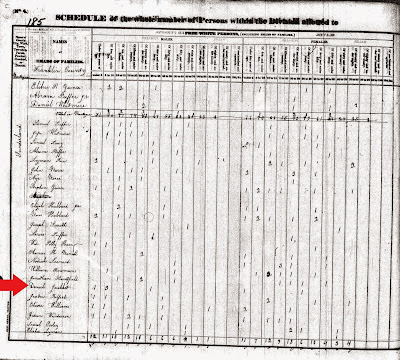 If Daniel and Lucy were married in December 1820 and George wasn't born until 1828, it was reasoned that there were very likely other children. Perhaps he had siblings who could help direct future research. 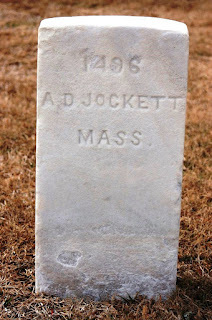 To get me started, the genealogist shared an 1864 death record for a possible sibling named Alonzo Daniel Jockett (sic) who was born in Deerfield, Massachusetts to parents Daniel and Lucy Jockett. The surname's spelling of Jockett was different, but not so dissimilar to throw in the towel. Daniel Jucket and Lucy Hawks were married in Deerfield, so Alonzo's birth location indicated we were looking in the right place. He was 43 years old when he died, also suggesting we were looking at someone born at the right time (in 1821). Based on these facts, I'm inclined to believe Alonzo Jockett was a son of Daniel and Lucy (Hawks) Jucket. 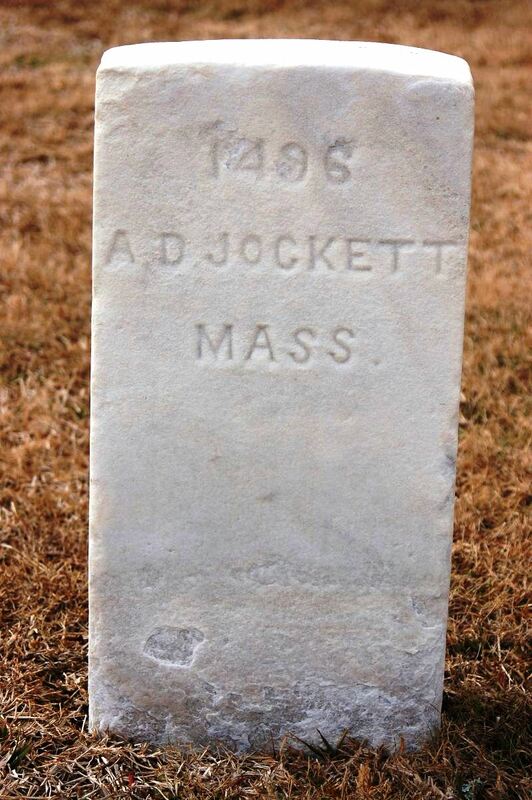 Alonzo Jockett was a shoemaker (boot cutter) in Amherst and enlisted as a Private with the 27th Massachusetts Regiment of Volunteer Infantry in November 1863. In September the following year, he was stationed near New Bern, North Carolina. A regimental history recounts that on "September 5th, New Berne (sic) found itself attacked by a force more subtile and deadly than that of the Confederates; no less a foe than yellow fever in its most malignant character." 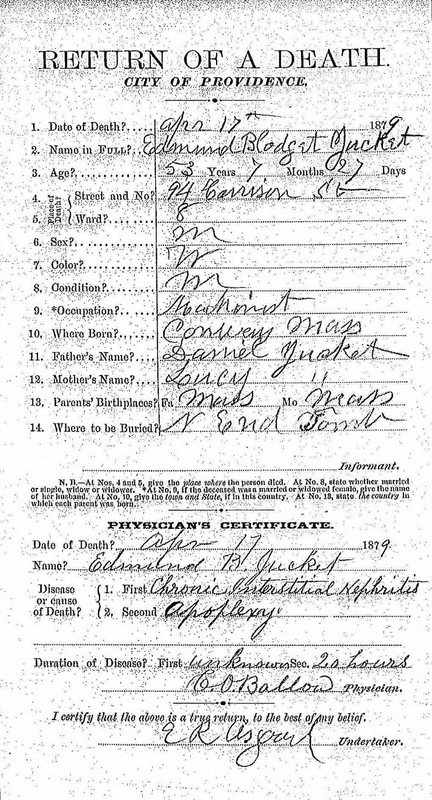 Fifteen members of the regiment went into New Bern as "nurses and assistants during the epidemic," including Alonzo. The history notes that he fell victim to the scourge, and praised his courage. Photo by Phil Weller. Used by permission. "Men who will take their lives in hand and go into such a plague-stricken city to rescue their unfortunate comrades, are worthy of a lasting monument. 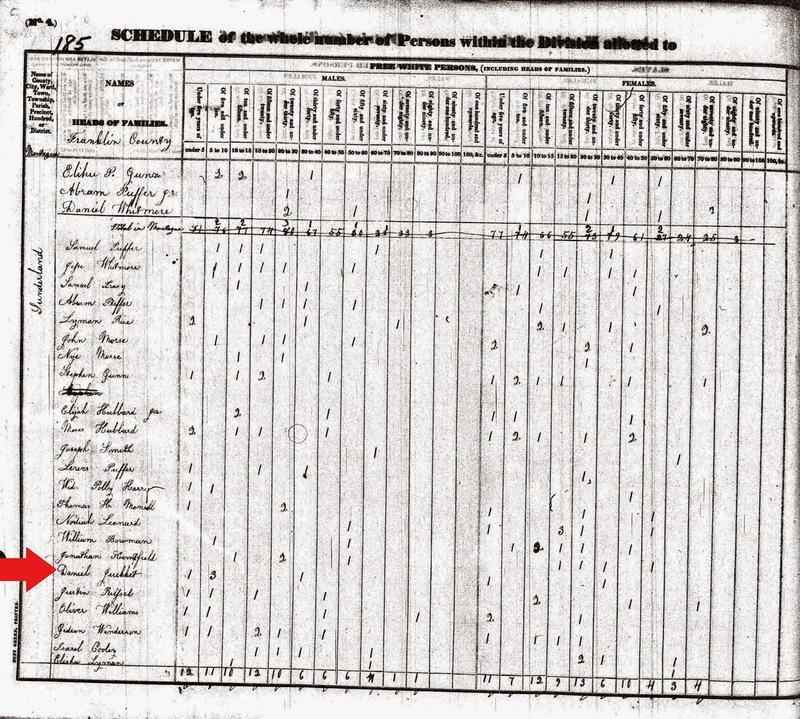 We gladly record their noble act as reflecting honor upon themselves, the regiment, and the State..."
The 1830 Federal Census for Daniel Jucket's family suggested that George did have siblings. There were five children (four boys and one girl) living in the household. Of course, the census didn't provide their names or define relationships. However, I strongly suspect that George is the youngest boy enumerated and the others are likely siblings, including Alonzo. 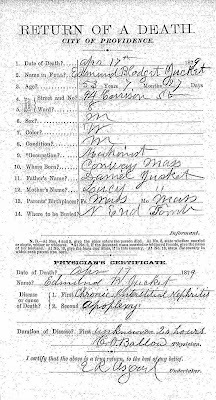 Searching under the Jucket surname (and spelling variations), I was able to locate a death certificate for another likely brother. 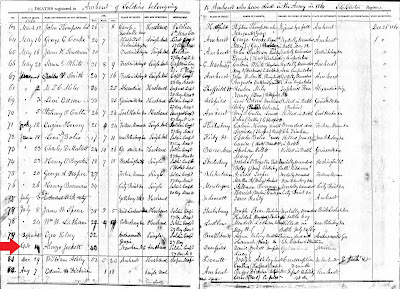 Edmund Blodget Jucket died in April 1879 in Providence, Rhode Island. He was born in August 1825 in Massachusetts to parents Daniel and Lucy Jucket. I was hopeful the record would give Lucy's maiden name. It did not. However, Edmund's middle name of Blodget is a telling link to Lucy Hawks. Her mother's maiden name was Blodget. The evidence suggests we've found another brother. I connected with a great-great-grandson of George Hawks (through his son Henry), who shared with me a photograph of a gold pin passed down through their family. It affirms the link to Edmund Jucket. The pin depicts a small fire engine and is inscribed on the back "E.B. Jucket 1870." Edmund was the inventor and manufacturer of the Jucket Steam Fire Engine. 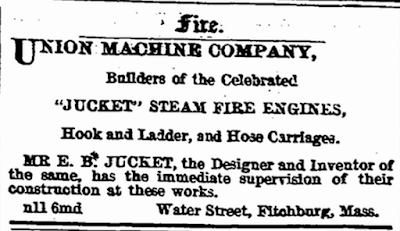 The grandson shared family lore that said the "pins were given to Jucket employees to commemorate the first engine produced by the company. Given the material (gold) and workmanship, I believe it more likely that pins were made for Jucket family members." A Jucket-inscribed pin passed down through the Hawks family is a strong indicator of a connection between the two surnames. The evidence is strong that Alonzo Jockett and Edmund Jucket are brothers to George Hawks. The question remains, though, why did they keep the Jucket surname and George took Hawks? I can only speculate based on the facts currently available to me. I believe that Alonzo and Edmund were old enough when their mother passed away that their identities were rooted in the Jucket name. George was younger and wouldn't know the difference if the surname was changed. Whatever the circumstances, if you're going to uncover siblings, you can't go wrong with a Civil War hero and an inventor.